For the subway service internally designated "S", see Franklin Avenue Shuttle. Three services in the New York City Subway are designated as a dark gray S (shuttle) service. These services operate as full-time or almost full-time shuttles. In addition, two services run as shuttles during late night hours and one service runs as a full-time shuttle but retain their regular service designations. All of the following services are officially labeled S. The "NYCT designator" column stands for New York City Transit's internal designation for the service. Times Square Grand Central Operates at all times except late nights. Three trains operate separately on each of three tracks. To be rebuilt and reconfigured for ADA-accessibility. to Rockaway Boulevard Rockaway Park–Beach 116th Street Operates at all times. Three trains operate on the double-tracked Rockaway Park branch of the IND Rockaway Line. Franklin Avenue Prospect Park Operates at all times. Two trains operate on the mostly single-tracked BMT Franklin Avenue Line, passing each other near Botanic Garden. Dyre Avenue Shuttle Eastchester–Dyre Avenue East 180th Street Formerly designated 9 before the line became an IRT line & SS. Lefferts Boulevard Shuttle Euclid Avenue Ozone Park–Lefferts Boulevard Operates concurrently with regular A service. Designated (gray A) on the late night map and (blue S) in the schedule and on trains. The S appears yellow on the trains themselves. Myrtle Avenue Shuttle Middle Village–Metropolitan Avenue Myrtle Avenue Formerly designated SS. Other routes have in the past been designated S or SS; the label has also been used for temporary shuttles due to construction. Before June 1979, all shuttles had the label SS; the designation S was reserved for "special"' services, including IND trains to Aqueduct Racetrack. The SS label was first applied in 1967, when all services were labeled due to the completion of the Chrystie Street Connection. The "2007 Holiday Shopper's Special", which ran on December Sundays, is a train of museum subway cars. This particular car is displaying the (former) S Special on its rollsign at the 23rd Street (Sixth Avenue) station. Some shuttle routes also used the H or HH designation, which were the last to be assigned to the Independent Subway System. Former uses include the Court Street Shuttle from 1936 to 1946 and Rockaway Park Shuttle until 1993, when that route's label was changed to a blue S. A temporary shuttle opened in November 2012 after Hurricane Sandy destroyed track connecting the Rockaways to the rest of the system used the H designation. When the Transit Authority began assigning labels to all services, the Third Avenue Elevated was designated as 8 because it was deemed too long to be considered a "shuttle". However, trains on this line showed SHUTTLE on their rollsigns instead of "8". The service was discontinued in 1973. This shuttle ran only from May to September 1999 during the rehabilitation of the Williamsburg Bridge. The shuttle ran from 6:00 am to 10:00 pm daily from Essex Street to Broad Street (Chambers Street on weekends). Two trains operated separately on each of two tracks on the BMT Myrtle Avenue Line between Myrtle-Wyckoff Avenues and Middle Village-Metropolitan Avenue. They ran at all times between September 2, 2017 and April 27, 2018 due to construction on the BMT Myrtle Avenue Line's connector with the BMT Jamaica Line. It was designated as an orange "M" on maps, schedules, and station and service notice signs, and as a brown "M" on the R42 rolling stock, which still had the brown "M" emblems that the route used before 2010. The Lenox Terminal Shuttle (also Lenox Shuttle and Lenox Avenue Shuttle) ran between 148th Street and 135th Street when the 3 did not run. Prior to May 13, 1968, it was called the 145th Street Shuttle, running only to 145th Street, and only from 9:00 pm to 1:00 am. It was in place by 1918, but may have been started in 1905 when the IRT White Plains Road Line opened to the IRT Lenox Avenue Line. Between 1969 and 1972, it was folded into the 3, but continued to run as a shuttle at those times. Late night 3 service ended on September 10, 1995, due to low ridership, and was not restored until July 27, 2008. During this time, the route was served by a free overnight shuttle bus. After the BMT Myrtle Avenue Line south of Broadway ceased operation on October 3, 1969, the MJ service was discontinued and the current nighttime/weekend M shuttle was formed, using the lower level platforms in the same station complex. However, this service was labeled SS and considered a separate route from the M until the two routes merged in 1973. 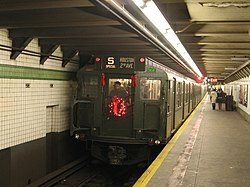 On September 30, 1990, late night R trains began operating as a shuttle in Brooklyn, between 36th Street (cut back from 57th Street in Manhattan) and 95th Street. In 1999, northbound trains began skipping 53rd Street and 45th Streets to avoid discharging passengers on tracks used by through trains. From September 8, 2002 until February 22, 2004, this service was extended northward to Pacific Street, due to reconstruction of the Coney Island station, running express north of 36th Street. On November 5, 2016, late night R trains were extended to Whitehall Street in Lower Manhattan. ^ "Late Night Service Map" (PDF). Metropolitan Transportation Authority. January 2017. Retrieved January 11, 2017. ^ "T7041404 Reconstruction of Times Square Shuttle - Phase 3". web.mta.info. Metropolitan Transportation Authority. Retrieved September 3, 2017. ^ "1979 Subway Map". Photobucket. New York City Transit Authority. June 1979. Retrieved October 30, 2016. ^ "Article 1 -- No Title; East Tank Line. West Trunk Line. Park Place, William and Clark Street Subway, (City Owned.) Firet Subway and Extension is BrooklyN, (City--Owned.) Second Avenue Elewated Line, (Company Owned.) Third Avenue Elevated Line and Extension. Sixth Avenue Elevated Line, (Company Owned.) Ninth Avenue Elevated Line and Extenxion, (Company Owned.) Lines for Operation by the New York Conrsolidated Railroad Company (B. R. T.) Fourteenth Street-Eastern Line. (City Owned.) Broadway Elevated Line, (Company Owned.) Myrtle Avenue Elevated Line, (Company Owned.) Lexington Avenue Elevated Line, (Compnny Owned.) Fifth Avenue Elevated Line, (Company Owned.)". The New York Times. May 19, 1918. ISSN 0362-4331. Retrieved July 11, 2017. ^ Bleyer, Jennifer (July 17, 2005). "In a City That Never Sleeps, Two Stations That Doze". The New York Times. ISSN 0362-4331. Retrieved July 11, 2017. ^ "Service Enhancements on 3 Line" (Press release). MTA New York City Transit. July 24, 2008. Archived from the original on May 8, 2014. Retrieved July 26, 2008. "SUB-DIVISION B TRAIN OPERATOR/CONDUCTOR ROAD & NON-ROAD WORK PROGRAMS IN EFFECT: NOVEMBER 6, 2016" (PDF). progressiveaction.info. New York City Transit. July 29, 2016. Retrieved August 19, 2016. Lam, Katherine (October 23, 2016). "MTA flyers spotted for W train's return in November". PIX11. Retrieved October 24, 2016. "New NQRW Service". mta.info. Metropolitan Transportation Authority. October 2016. Retrieved October 26, 2016. This page was last edited on 8 April 2019, at 11:54 (UTC).